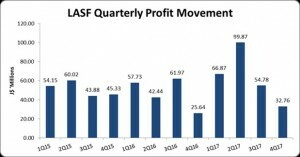 Lasco Financial Services (LASF), for the year ended March 31, 2018 recorded a total of $1.55 billion in Trading Income; this represented a growth of 51% relative to the $1.02 billion recorded in 2017. Other Income amounted to $72.02 million, a rise of 53% compared to $46.97 million in 2017, this resulted in overall income of $1.62 billion, a growth of 51% compared to $1.07 billion in 2017. For the fourth quarter Overall Income was $500.15 million up 108% (2017: $240.18million). Operating Expenses totaled of $1.22 billion, 46% more than the $834.28 million the year prior. Selling and Promotional Expenses increased 37% to close at $593.04 million relative to $432.87 million in 2017, while Administrative Expenses rose 56% to close at $624.99 million (2017: $401.40 million). For the fourth quarter, Operating Expenses totaled $398.19 million (2017: $205.44 million). As a result, Profit from Operations grew by 70% to total $402.24 million, relative to the $236.32 million recorded last year. Finance Cost amounted to $66.82 million (2017: $4.84 million), resulting in Profit before Tax of $335.42 million relative to $231.47 million in 2017. After taxation of $81.13 million (2017: $43.69 million) Net Profit amounted to $254.28 million relative to $187.78 million in 2017 an 35% advance. Net profit for the quarter amounted to $32.76 million, a 28% jump from last year’s $25.64 million. Consequently, Total comprehensive Income moved up by 32% to close the period at $254.28 million relative to $192.11 million posted for 2017. Earnings per Share for the year amounted $0.20 (2017: $0.15), while EPS for the quarter totaled $0.03 relative to $0.02 last year. The number of shares used in the calculation was 1,264,694,391. The stock price as at May 30, 2018 closed at $5.21. As at March 31, 2018, the company’s assets totaled $3.39 billion, $1.83 billion more than its value a year ago. This increase in total assets was largely driven by increases in ‘receivables’ and ‘Intangible Assets’ which closed at $1.83 billion (2017: $663.08 million) and $842.71 million (2017: $17.71 million) respectively. However, ‘Short term Deposits’ drastically declined by 79% or $291.59 million to total $79.26 million. Equity attributable to stockholders of the company amounted to $1.37 billion (2017: $1.56 billion). This translated to a book value per share of $1.08 relative to $0.91 in 2017.